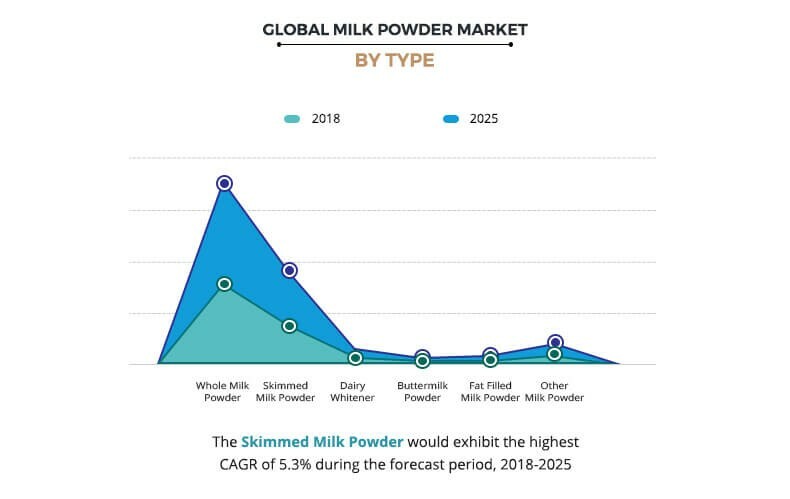 The global milk powder market was valued at $27,783.3 million in 2017 and is projected to reach $38,086.1 million by 2025, growing at a CAGR of 4.4% from 2018 to 2025. Milk powder is a dry dairy product, manufactured by dehydrating milk using evaporation. The purpose of making milk powder is to increase the shelf life of milk without using the refrigerator. Various types of milk powder include whole milk powder, skimmed milk powder, dairy whitener, and other. It is widely consumed globally due to its nutritional benefits, which has found its application in infant formulas, confectionaries, baked desserts, and savory items. 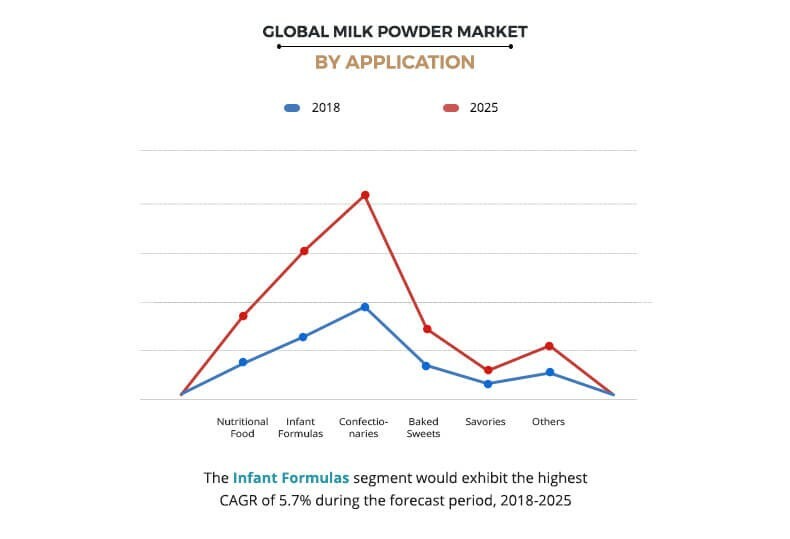 The factors such as increase in use of milk powder in infant foods and the presence of several nutrients such as vitamin C, vitamin B12, thiamin, and high amounts of protein drive the global milk powder market. Furthermore, reduced storage and transportation costs fuel the growth of the milk powder market. However, addition of preservatives, adulteration, and strict regulations related to infant food restrains the growth of the milk powder market. 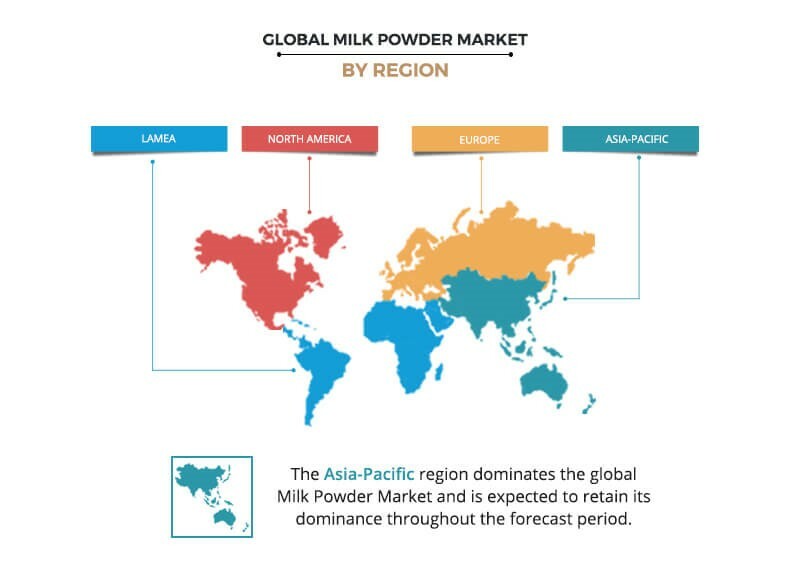 Development of flavored milk powder has led to new opportunities in the market. Milk powder is made by dehydrating milk through roller drying and spray drying. Different types of milk are used to derive milk powder, which determines the composition of the milk powder. Based on report, the milk powder market is divided into whole milk powder, skimmed milk powder, dairy whitener, buttermilk powder, fat-filled milk powder, and others. Whole milk is perceived to be the most natural form of milk by a large number of consumers but is far less popular with people who are concerned about their weight or people who are on a special diet. Whole milk powder has higher calories and is suitable for people who require high amounts of calories. It is also used as an ingredient in food items that need thicker consistency. Milk powder is applicable for use in a number of dairy products. It serves as a key ingredient in a number of health products, which are high in protein and essential vitamins. The report segments the application segment into nutritional food, infant formulas, confectionaries, baked sweets, savories, and others. Increase in participation of women in labor force has led to rise in number of women working outside their houses, which drives the growth of the infant formulas market. Infant formulas present an appealing alternative to working mothers for their babies as per the need and convenience. Based on region, the milk powder market is analyzed across North America, Europe, Asia-Pacific, and LAMEA. The milk powder market in the Asia-Pacific is driven by changing lifestyles, which is led by globalization and increase in working population. The rise in the affluent population and increase in penetration of internet and social media drives the consumption of processed and packaged food, which makes way for packaged goods in the region. Whereas, in LAMEA, the milk powder market continues to grow quickly due to changes in consumer work and lifestyles, which as a result has encouraged people in the region to start depending on packaged food item. Moreover, increase in consumption of infant formulas has added to the demand for milk powder in the region. Key players profiled in the report include Arla Foods amba, Dairy Farmers of America Inc., Danone, Dean Foods Company, Fonterra Co-operative Group, Kraft Foods Inc., Lactalis Group, Nestle S.A, Saputo Inc., and Schreiber Foods Inc. The report provides an extensive analysis of the current and emerging market trends and opportunities in the global milk products market. A comprehensive analysis of the factors that drive and restrict the growth of the market is provided. 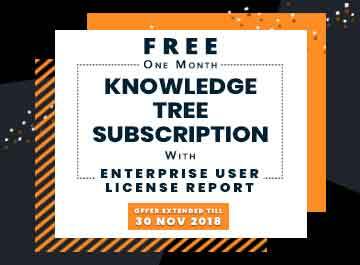 An extensive analysis of the market is conducted by following key product positioning and monitoring the top competitors within the market framework. The global milk powder market is emerging at a considerable pace due to several factors such as people seek quick and easy meal solutions, owing to busy lifestyle, which has increased the demand for processed food items. 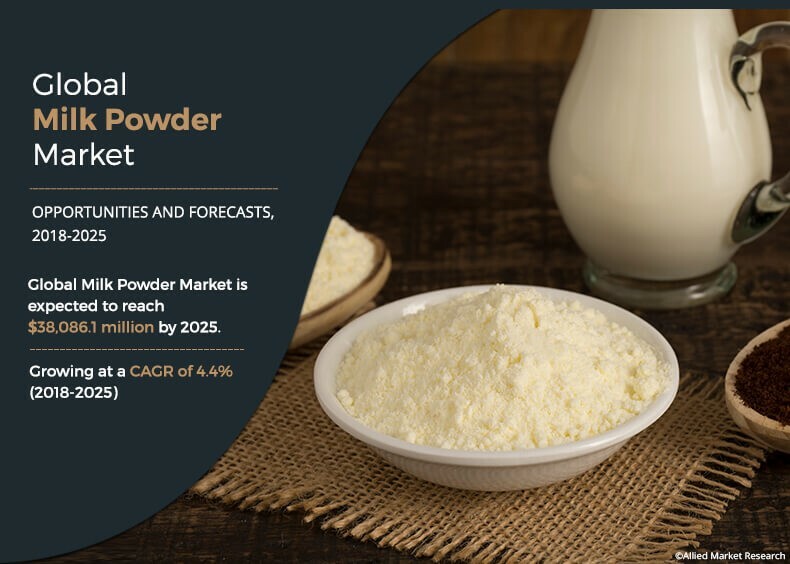 This in turn has increased the demand for packaged food, fast food, and ready-to-eat meals, thereby supplementing the growth of the milk powder market. Moreover, factors such as high nutritional value and reduced storage and transportation costs have fueled the demand for milk powder. The whole milk powder and skimmed milk powder segment gain popularity, as they have fewer additives and hence are nutritious. However, presence of additives and stringent regulations related to infant food restrain the growth of the milk powder market. Introduction of new products that are made from organic ingredients is expected to break the notion of milk powder containing artificial ingredients. Also, introduction of milk powder with properties such as gluten-free lactose and sugar-free is expected to please the health-conscious population providing lucrative opportunities for the growth of the milk powder market in future.